Alamo.com will make your next vacation the best it can be with our great NEW discounts. At Alamo you will get the best deals in the business. Head to our web site now and start saving with Alamo Rental Cars. This wonderful tour takes you through the historic parts of Portsmouth, New Hampshire, as well as those beautiful scenic views that interest everyone coming to visit, and even those that are familiar or live in the area. The Harbour Trail contains over 70 point of interest with 10 buildings that are on the National Register of Historic Buildings, 10 National Historic Landmarks with three marvelous old home that are taken care of by the Society for the Preservation of New England Antiquities. There are guided walking tours, however, you will have to stay with the group and may want to investigate another point of interest, whereupon you would have to return later; which makes the best way to do the trail is to get a map and it will guide you at your own pace. There are three main areas of importance; downtown and the waterfront which is about a mile and will take approximately an hour; the south end which is about the same amount of time and distance and the State Street to Haymarket Square and Congress Street area; but this one only is half a mile and will take an hour. The first European settlers to the area were the English who settled along the Piscataqua River because of its deep harbor, and the proliferation of fish and timberland. Wild strawberries grew along the banks and so it was named Strawberry Banke, but was later changed to Portsmouth in 1653. It slowly grew into an important commercial trading center and became the capital of the colony of New Hampshire in 1679, until the middle of the war. Sometime in the mid 1700s, Haymarket Square became Market Square and the city's economic and commercial hub, also becoming the training ground for the militia, where the meeting house was and the site of New Hampshire's Colonial Legislature. It was also the first place to be paved in the city, in 1762. Numerous buildings were destroyed by fire in 1802, and were rebuilt with brick, so the north end is an excellent example of 19th century commercial blocks in the nation that survived the years. North Church was built in 1854 replacing the meeting house and is impressive on the east end and can be seen throughout the city. This square and the church are part of the tour and actually the first two areas to be looked at. Further along you will come to Market Street with its old buildings that have survived the 190 years since they were built, and many of the storefronts have cast iron fronts that were added in the mid 1800s. Walking this street will give you a strange feeling of nostalgia, reminding you of times gone by in your own past. This feeling may or may not follow you around this exciting city, but no matter what you feel, it will remind you of the many years that this part of the nation has been living. The Athenaeum was started by the Portsmouth Athenaeum Society in 1817, and is a library, museum and gallery on Market Street in a Federal style building that was constructed 1805, and was the home of the New Hampshire Fire and Marine Insurance Company until 1981 when it went bankrupt. In 1995, the society was growing and needed more space in the building, so took over the third floor for its Copley Research Library and Randall Gallery. Similar to most athenaeums, that combines the library, art gallery and museum, it has kept its 19th century customs and the members are called proprietors and the director is called the keeper. With a spectacular collection of over 40,000 books, it contains an archive of 12,000 photographs and a third of those are posted on the website. 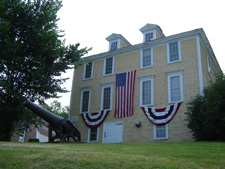 Since the city was such an important seaport, the athenaeum has a great amount of maritime history, especially the shipbuilding that took place at Badger's Island and the Portsmouth Naval Shipyard; both of which are across the river in Kittery, Maine. The building's walls are hung with paintings of ships and the wooden hull models that were used to build them. Also, there are paintings of important people from the area, including shipbuilders, sea captains and merchants. In the reading room is a full length portrait of Sir William Pepperrell; a merchant and soldier from Kittery, Maine; which was actually part of the colony of Massachusetts back then, and he is well known for his part in the 1745 King George's War, where he led the attack that captured the French fortress of Louisbourg in Nova Scotia. There is also a small town in Massachusetts today that bears his name, Pepperrell. Actually the home of Captain Gregory Purchell, it was built in 1758, and Purchell and his wife lived there until he died in 1776. The widow had to take in boarders to make ends meet, and one of those boarders was Captain John Paul Jones; who stayed there from 1781 until 1782, while his ship America was being constructed and he overseed the entire process. This home is the only surviving building where the great war hero was known to have stayed. It became a National Historic Landmark in 1972, as well as being listed on the National Register of Historic Places and is located at the intersection of Middle and State Streets in Portsmouth. Captain Jones was really the first known hero of the American Revolutionary War, but made many wealthy Americans unhappy with his mannerisms. No matter what they felt, he was instrumental in saving the day when he fought against the British ship Serapis. It was during this battle that his famous line in response to a message to surrender from the British captain was; "I have not yet begun to fight!" John Paul, as he was really known, started sailing at an early age, 13, and worked his way up through the ranks; commonly referred to today as a mustang. His older brother was married and living in Fredericksburg, Virginia, where John' travels brought him often. He became a third mate in 1764 aboard the King George and first mate aboard the Two Friends in 1766. This ship was engaged in slave trading, which was so cruel and disgusting that young John Paul left the ship in Jamaica in 1768 and sailed back to Scotland, where he was born and had been raised. He eventually found another ship, the brig John, leaving port in 1768, and his career was quickly changed when the captain and bosun were struck down with yellow fever. After he brought the ship safely to port with its rich cargo, the owners made him the captain and gave him 10% of the profits. He did two trips to the West Indies and back, although on the second of these, in 1770, John Paul had a man flogged severely which put his reputation in question. He was exonerated, but the man died a few weeks later of the flogging and John's reputation and life were never the same. One of the best car rental companies in the business is Budget Rent-A-Car. Budget has the best customer service staff in the rental car business. Budget Rental Cars will have you out on the road faster and without worries. Head to our web site now and start getting the best rental car discounts in the business at Budget. Manchester-Boston Apt Budget Car Rentals - 1 Airport Rd. Budget Car Rental Nashua - 94 E. Hollis St.
Richard Jackson was a wonderful woodworker; and also a farmer and mariner; that built a fantastic home of wood on his family's 25 acre plot near the Picataqua River. This was in 1664, and the oldest wooden house in New Hampshire and Maine still sits there, where Richard built it. The forests around the area were full on great tall pine trees and these trees were cut and shipped down the river where along the way were massive lumber mills run by the rushing waters, and into the city where they were used for buildings, ships, docks and many other uses. This house is similar to the English post-medieval prototypes, although most more extravagant since it uses so much wood. Over the years family descendants added a lean-to and more rooms as the families grew. The home is a National Historic Landmark and is located on Southwest Street in Portsmouth, New Hampshire. The statehouse in Concord, New Hampshire is the oldest one in the United States and was constructed from 1816 until 1819 and designed by Stuart James Park. It is a Greek Revival style building using smooth granite blocks, with an entry way portico that is held up by Corinthian columns. The balcony above it is surrounded by a balustrade separated by Corinthian columns also. The first floor windows are rectangle, the second arched and the third square. It sits on 2.6 acres, with a granite fence surrounding the grounds with no gate at the entrance. There are numerous statues adorning the grounds, including; Franklin Pierce, the only President from the state, Daniel Webster, General John Stark and John P. Hale, an American politician and lawyer that served in the U.S. House of Representatives from 1843 to 1845 and the Senate from 1847 to 1853, and again in 1855 to 1865; a member of the Free Soil Party and its presidential nominee in 1852. Another statue was built in 1902 of George H. Perkins, who was a commodore in the navy during the Civil War; by sculptor Daniel Chester French and architect Henry Bacon. The General Court's first session held there was in 1819, and it is the oldest state house where the legislature still meets. Enterprise Rental Car Coupons will get you the best discounts in the car rental business. Enterprise will help you choose the best vehicle for your vacation with our friendly staff. Head to our web site now and start saving. Concord Enterprise Rental Car - 28 Manchester St.
Enterprise Rental Car Manchester Apt - 1 Airport Rd. Manchester Enterprise Rental Cars - 766 Gold St.
Enterprise Rental Cars Manchester - 526 Second St.
With a beautiful view of the ocean, this casual dining establishment serves a contemporary style menu that features fresh seafood, but also has chicken, duck, steak and pasta dishes. With fresh linens on the tables, fresh flowers as well, the candlelight accompaniment sets the mood for this romantic interlude. This is a marvelous place to celebrate life with great food, awesome views and friendly people. Considered to be one of the premier dining destinations on the east coast, the cuisine is especially fantastic and enjoyable. The extensive menu contains a few samplings listed here; jumbo shrimp cocktail with sauce and lemon; oysters casino are 4 Spinney Creek oysters on the half shell with bell pepper herb butter, smoked bacon and breadcrumbs; bistro style potato skins stuffed with gulf shrimp, caramelized onions, Portobello mushrooms, Applewood smoked bacon and fontina cheese accompanied by chipotle aioli and cilantro lime crÃ¨me fraiche; baked crab, artichoke and Boursin cheese dip flavored with goat cheese, fontina, Brie, herbs and roasted garlic, accompanied by toasted baguette rounds; lobster and wild mushroom ragout is sautÃ©ed lobster meat in a rich wild mushroom, brandy and sherry cream served with toasted baguette rounds. Soup and chowder include; seafood chowder with tender clams, scallops, shrimp, lobster meat and haddock with onions, bacon and potatoes in a creamy seafood broth; hearty chicken and sausage soup with grilled chicken, Italian sausage, tomato and pesto; French onion soup au gratin with garlic crouton, Parmesan, Gruyere and Fontina cheeses. Salads include; Greek salad with romaine, marinated with vegetables, calamta olives, cucumbers and feta cheese topped with an oregano lemon vinaigrette; spinach salad with pickled onions, toasted almonds, fried Brie cheese, fresh apple, Mandarin oranges, dried cranberries, raspberry vinaigrette and a balsamic reduction. The beef, veal and poultry menu includes; Ron's Landing sirloin is a grilled lightly seasoned 12 ounce sirloin served with roasted red potatoes; steak tips and lobster scampi is an 8 ounce char-broiled filet mignon topped with au poivre sauce, served with garlic Parmesan whipped potatoes; lamb osso bucco is a slow roasted lamb shank in a red wine tomato ragout with fresh egg fettuccine, roasted golden beets and grilled Portobello mushrooms; chicken piccata is sautÃ©ed twin chicken breasts with capers, button mushrooms and Cavatappi pasta in a white wine lemon butter sauce with fresh asparagus; and Caribbean style grilled chicken and shrimp is Jamaican jerk marinade grilled chicken breast and sugar cane grilled jumbo shrimp with pineapple salsa, baby field greens, steamed white rice and a spicy coconut mango rum glaze. Seafood and pasta menu is; Frito misto with haddock, scallops and clams baked with sweet butter and seasoned bread crumbs served with roasted red potatoes and fresh asparagus; grilled pesto and feta cheese encrusted swordfish with steamed broccolini, pan-fried artichoke hearts, cherry pepper coucous and a roasted garlic tomato and olive relish; toasted almond salmon is oven roasted fillet of salmon with Hoisin glaze, served over a Frangelico cream, garnished with chopped scallions, sliced apple and toasted almonds, accompanied by house blended rice. 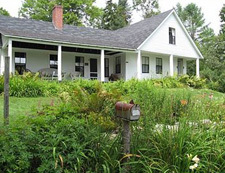 The Chesterfield Inn is a completely restored farmhouse with cathedral ceilings and panoramic views of the Connecticut River Valley. With hearty country breakfasts in bed, to the elegant dining room feasts in the evening, this is a place that is sure to please your palates. The cuisine here is nothing short of spectacular and scrumptious with pleasant servers and an ambiance that will knock your socks off before going to bed. The views from the dining room, parlor and terrace will exceed your expectations of what a New England bed and breakfast should be like and the porch area allows for a very intimate and romantic experience. The breakfast usually includes; fresh fruit, fruit juices, Green Mountain coffee, freshly baked scones or muffins made from our own kitchen with the best ingredients from scratch, choice of eggs any style or omelets, pancakes, maple cinnamon French toast, bacon, sausage, ham and toast or English muffins. Chef Bob Nabstedt loves to cook and when a guest has told him that they tried something they never had before, he is always pleased. Creating delicious plates that include fresh, imaginative foods with flavorful combinations is why he prepares this special cuisines. The seafood is from Boston, the herbs are from the inn's own gardens, with cheeses and vegetables from the local farmers. Breads, muffins and pastries are made fresh each day, with enthusiasm and creativity. The dinner menu is always changing due to the seasons, but includes soup of the day, and specials. Some of the most popular are rosemary and walnut crusted rack of lamb with merlot glaze and red onion marmalade, seared scallops with tomato fennel saffron broth served on top of fresh pappardelle, and wild game sausages with ale mustard sauce. National Rental Car Coupons will get you on the road quickly and worry free. National has the friendliest staff people in the car rental business. You will have a more enjoyable vacation with National Car Rentals so head to our web site now and get the BEST savings online. Summer or winter, and could play alone." This world renown art museum in Manchester, New Hampshire is home to many fantastic works of art, including American and European paintings, sculpture, decorative arts and photographs. Their permanent collection includes such magnificent works by Andrew Wyeth, Frank Lloyd Wright, Picasso, O'Keefe, John Singer Sargent, Calder, Monet, Shceier, Matisse, and Goldsmith. The museum has tours, live classical music, family days and other public programs. It was first known as the Currier Gallery of Art, when in1929, the former governor of New Hampshire, Moody Currier and his third wife Hannah Slade Currier bequest funds for the creation of the museum. Although Moody wasn't a collector himself, he left money to start a collection for the advancement and betterment of humanity. When Hannah died in 1915, trustees were appointed to carry out the wishes of the Curriers' and in 1929 the gallery was opened. The first director and one of the first woman in the country to have that position was Maud Briggs Knowlton. New pavilions were added in 1982 to make room for the growing collection, and the Currier Art Center opened in the old Women's Aid Home next door in 1998. In 2002, the name was changed to the Currier Museum of Art, to reflect the true mission and intent of the museum. A major expansion was started in 2005, and the museum closed in 2006 to continue the expansion and opened again in 2008, receiving the American Institute of Architects Design Honor Award and the Peoples Choice Award. Make your next trip to New Hampshire the best it can be with Avis Rental Cars. At Avis you will get your car rental without hassles and it will be easy to do. Avis Rental Cars will help you choose the best car for your vacation from our great selections. You will also get the BIGGEST discounts at Avis Car Rentals so head to our web site today and start saving big. Concord Airport Avis Car Rental - 71 Airport Rd. Avis Car Rental Manchester Airport - 1 Airport Rd. La Quinta Inn Salem Avis Rental Cars - 8 Keewaydin Dr.
Merrimack Residence Inn Avis - 246 Daniel Webster Hwy. Welcome to the first true treetop canopy tour in New England, at Lincoln, New Hampshire, with 6 ziplines that are 80 feet high and 900 feet long. There is also a suspension bridge that is 60 feet in the air and 75 feet long that goes across Barron Gorge. The trip also includes, but optional, zip number 7 which is a 35 mph free fall. A safari type ride in a Pinzgauer will take you to the top, with spectacular views along the way and on the ziplines themselves. You will start at the Treewalk Village, where the western White Mountains give you some of the most magnificent views in New England, and descend. As you ride the dualing ziplines, you head to area 51, which a plateau with beautiful views from an overlook, then take off again from the ground to zip along the longest line that is 200 feet above the ground and goes for 1500 feet where you come to Hemlock Walk. From there you will cross 2 Burmese bridges and go to the zipline known as Montego Bay Express, that is a 1200 foot zip. The final zip is the White Knuckle Pine, where the line drops 80 feet and gets up to 50 mph. The folks there advise guests to be in fairly good shape as they must do some hiking, climbing and descending with a weight restriction and age recommendation. If you are worried about the heights of this tour, then they have one called the Treetop Canopy tour for your first time, but they promise both are as exciting and thrilling as you could want or handle. The cost is $85 a person, but if you have 8 or more than you will get a 10% discount. The entire trip is anywhere from 2 to 2.5 hours. You must weigh between 70 and 240 pounds because of the courses gravity feeds and also for the safety of their guests; you. They also suggest that no on under the age of 10 do the course which could be scary to some younger folks. NO alcohol, drugs or vulgarity allowed, and smoking anywhere on the property is prohibited. The oldest museum on the continent that has operated continuously since opening is the Hood Museum of Art in Hanover, New Hampshire and part of Dartmouth College; and connected to the Hopkins Center for the Arts. The building that the museum is housed in was designed by Charles Willard Moore and Chad Floyd in 1985 and contains the permanent collections, as well as visiting exhibitions. There is also a store and cafe, and the Arthur M. Loew Auditorium is below. There are over 65,000 objects, and a collection of Assyrian stone reliefs from Nimrud, Iraq. Paintings be the following great artists are hung here; John French Sloan, Perugino, Georgia O'Keefe, Luca Giordano, Claude Lorrain, Rockwell Kent, Nicolas Rene Jollain, Gignoux, Pompeo Batoni, Joseph Blackburn, Elisabeth Vigee-Le Brun, Jan Davidszoon de Heem, Alfred Sisley, Vuillard and Picasso. The Baker Library next door contains some magnificent murals by Jose Clemente Orozco. The collection started in 1772, three years after the college was started and they are diverse, intricate and available for use by the college and community. The vastness of this collection cannot be imagined, but to consider there is the Americas collection from North America starting with the Native North American collection with an unbelievable 7000 objects with most being archaeological items that were given as gifts, the most prominent being the collection from Mrs. Margaret Kimberly with 800 stone artifacts, another 500 stone and ceramic pieces from Alexis Chapman Proctor, from the class of 1918, 525 ceramic vessels and shards from Mr. and Mrs. George H. Browne of Cambridge. For many years in the car rental business, Thrifty Car Rental has been a staple. Thrifty's customers will always get the biggest selection of new cars to choose from with the friendliest staff in the business. Thrifty Rental Cats will make sure you get the best discount in the car rental business. Thrifty Car Rentals is one of the best known companies in the business. Manchester Airport Thrifty Rental Cars - 1 Airport Rd. In 1906, Kellerhaus has been making candy, gifts and homemade ice cream on Lake Winnipesaukee in Weirs Beach, New Hampshire. It is the state's only ribbon candy maker and the premium hand made ice cream is fantastic; and it is famous for its smorgasbord ice cream bar, where you can use any amount of ingredients and toppings to create your own special sundae, split or whatever it turns out to be. The toppings for the ice cream are also made at the shop, so you know that everything in your dish is made fresh each and every day. There is a player piano to set the mood and the panoramic views of the gorgeous White Mountains surrounding the lake will astound you. They are the oldest candy maker, starting in 1906, creating the finest hand made chocolates and candies in the world, and have been making ice cream since 1920. Each day over a hundred different candies are made here and their chocolate fudge has been named the best anywhere by the New Hampshire Magazine staff. Since 1906, this family has continued to use the same recipes, techniques, ingredients and equipment to create its marvelous candies, confections and ice creams. They have an online site where you can order the delicious sweets, as well as pure maple syrup, maple candy, butter, sugar and maple mustard. They have jellies and jams, jewelry, pajamas, Bear and Katie books, gourmet foods and so much more. In the year of 1929, the Grand Chief, Sachem Silverstar stopped by a second grade class and spoke a message to the young children there; but is especially hit home with one such lad named Charles Bud Thompson. The chief spoke about the unique abilities of each person on this earth and the connection to all other life; that we each have a special power, a talent, a gift, that would make the world a better place and how he hoped that one day each of them would tell him about the positive difference they had made on the world. Going to his grandfather's farm to visit for the summer vacation, young Bud found an arrowhead and his lifelong love for the artifacts of the Native People would begin. Silverstar's philosophy still works its magic in Bud, and his wife Nancy; who co-founded the Mt. Kearsarge Indian Museum in Warren, New Hampshire. The Thompsons were unhappy with the way the environment was being destroyed by apathy and greed and created a unique museum that would do more that just house artifacts of a race gone with the wind, but a place where education, study and cultural messages would continue the dream of the great chief. The grounds, galleries, gardens and all the items would be used as teaching tools and a respite from the erratic pace of modern life. That was over 17 years ago, and almost a quarter of a million people from across this nation and 34 foreign countries have come to visit and enjoy the museum with a voice. One of the most memorable changes that have occurred since the Thompsons have become involved in their journey is the reclamation of an old dump where coils of barbed wire, broken manure spreader, an old safe without its door, refrigerator, ropes, broken glass and bald tires were spread across the land now belong to the Medicine Woods Nature Trail and an arboretum. With the help of friends, volunteers, trustees, the Student Conservation Association, Millican Nurseries, grants and donations, the transformation is nothing short of spectacular. In 1992, was dedicated, and John Peters, also called Slow Turtle, the Supreme Medicine Man of the Mashpee Wampanoag Tribe, presided over the dedication and his blessing has been on the woods, ever since. Dollar Rent A Car will always give you the best discount and the most reliable vehicle in the car rental business. With a name like Dollar, you know that you will get the best deal and it will be fast and worry free. This is a fairly new museum, although the house that contains it is not. The American Independence Museum was founded in 1991, and is in the Ladd-Gilman House that was built in 1721, however, the most incredible, unbelievable event that brought about its existence was the 1985 discovery of a Dunlap Broadside of the Declaration of Independence that was found there, and now the museum contains two very rare drafts of the U.S. Constitution and a purple heart; that was awarded by General George Washington. There are also numerous archives, military artifacts and period furniture. Also part of the museum is the Folsom Tavern that was built in 1775. The Dunlap Broadsides were the first copies of the Declaration of Independence, printed July 4th, 1776, by John Dunlap of Philadelphia and although no one knows for sure how many were printed up, the guess is about 200, although there have only been 26 copies found. The members of the Continental Congress ordered the committee that wrote the document should also oversee its subsequent printing. John Dunlap was a 29 year old Irish immigrant that was told to do the job with Benjamin Franklin supervising and John Adams and Thomas Jefferson were there to make sure all went well. John Dunlap worked most of the night to get the copies done, and because of certain evident mistakes, the work was rushed. There were watermarks in reverse, copies folded before the ink could dry and punctuation problems that moved around the papers. The broadsides were sent to the colonies during the next two days, one went to George Washington and one was sent to Great Britain. The original handwritten Declaration that was sent to Dunlap from the Congress has been lost, or never found. By 1989, only 24 copies had been recovered, when a shopper at a flea market bought a framed painting for four dollars and noticed a tear behind the lining and discovered a folded Dunlap Broadside. It was authenticated by Sotheby's and sold to Norman Lear and David Hayden in 2000 for $8.14 million. In July of 2009, another was found in the National Archives in Kew, England by a researcher that was cataloging a box of old documents. This is where the fourteenth President of the United States, Franklin Pierce spent his early years and childhood. It was built in 1804, by his father Benjamin Pierce, and could be his birthplace, while another home lies beneath the Franklin Pierce Lake, a reservoir, nearby. Franklin lived here until 1834, except when he left for school and to study the law. It stayed in his family until 1925, when the state took over the care and preservation of it. Daniel Webster is said to have visited and stayed here, and it was made a National Historic Landmark in 1961, and added to the National Register of Historic Places in 1966. It sits on the east side of Washington Road, 100 yards from the intersection of New Hampshire Route 9 in the lower village of Hillsborough, New Hampshire. Franklin was born in 1804, which is why there is some confusion about his birthplace, although it was most likely here. He was and is the only President that came from New Hampshire, a Democrat and doughface; which was a northerner with sympathetic feelings for the south. He served in the House of Representatives and the Senate; as well as serving in the Mexican-American War where he advanced to the rank of brigadier general. He had a successful law practice in New Hampshire and was the recipient of many offers to go into government but declined. He was nominated nonetheless as a dark horse candidate in 1852, on the 49th ballot and won, with William R. King as his running mate. He had a wonderful personality which would eventually sully his name because of unscrupulous politicians in Washington. RentalCarMomma.com and Hertz Rental Cars have teamed up to give their customers the best discounts in New Hampshire. Hertz Discounts will make sure that you get your vehicle without worries and get it faster. Hertz is your number one car rental company and the best in the business for many years. Hertz Rental Cars Concord Aviation- 71 Airport Rd. Hertz Rental Car Nashua- 333 Amnherst St.
Portsmouth Hertz Rental Car- 2800 LaFayette Rd.